Supermassive black holes practice a particularly savage form of carnage that rips apart unlucky stellar passersby. Scientists used to think that these starry cannibalistic events — called Tidal Disruption Events — were a rare occurrence, but they actually happen 100 times more often than previously thought, according to new results published Monday in Nature Astronomy. Researchers based at the University of Sheffield found that TDEs occur every 10,000 to 100,000 years per galaxy. The numbers compel scientists to reconsider how much black holes grow by gobbling up stars moving forward. Before, most experts thought most black holes grow by devouring interstellar gas and dust. 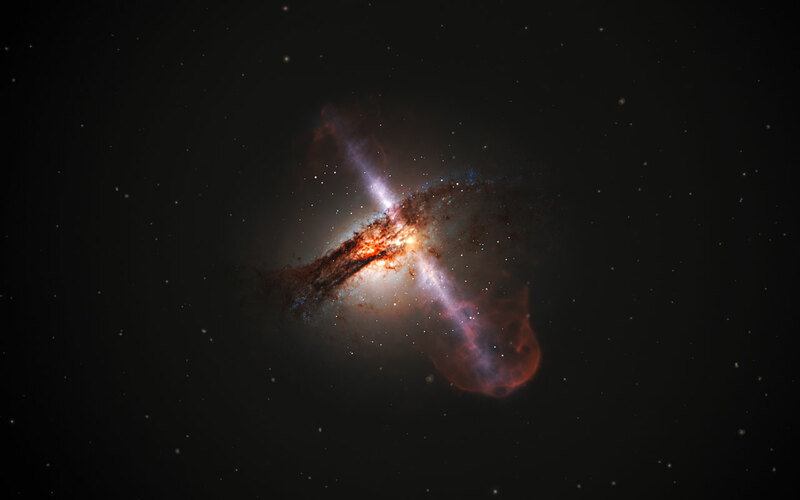 “However, with TDEs more common than previously thought, it may be that up to a quarter of the mass of a black hole could, instead, be accumulated via the swallowing of stars instead,” James Mullaney, an astronomer and co-author of the study, tells Inverse. In a relatively small sample of 15 galaxies, researchers in 2005 recorded a star being destroyed by a supermassive black hole. Each of these 15 galaxies was undergoing a “cosmic collision with a neighboring galaxy,” and when galaxies smash into each other and merge, many stars end up forming near supermassive black holes in the galaxies’ centers, leading to more TDEs. When researchers revisited this sample again in 2015, they found that one galaxy 1.7 billion light-years away, called F01004-2237, flared especially dramatically in 2010. Post-flare, researchers detected unusually strong helium emission lines, meaning that helium atoms in gas clouds are emitting lots of light. Tidal disruption events happen when a star that comes too close to a black hole gets ripped by the black hole's gravitational tides. This phenomenon is unlike any supernova or active galactic nucleus ever observed, and researchers believe this happened because of a TDE. Since this event happened in a period of just 10 years, the rate of TDEs is likely higher in colliding galaxies. The research team plans to continue studying more galaxy collisions to find more TDEs. Our Milky Way should expect to see a lot more stars getting shredded by black holes in the future. Right now, we won’t see many TDEs in the supermassive black hole at the center of our galaxy, but in about five billion years, the Milky Way will merge with the neighboring galaxy Andromeda — which likely means we’re in for more TDEs. “From Earth, we’d see these events as a ‘flare’ of light lasting a few months or years, which each flare brighter than any other star in the night sky,” Mullaney says. These dazzling flares visible to the naked eye will happen as often as every 10 to 100 years. We won’t be around to see this spectacular light show, and at least we can rest easy about not having to experience this chaos. Abstract: Tidal disruption events (TDEs), in which stars are gravitationally disrupted as they pass close to the supermassive black holes in the centres of galaxies, are potentially important probes of strong gravity and accretion physics. Most TDEs have been discovered in large-area monitoring surveys of many 1000s of galaxies, and the rate deduced for such events is relatively low: one event every 104 – 105 years per galaxy. However, given the selection effects inherent in such surveys, considerable uncertainties remain about the conditions that favour TDEs. Here we report the detection of unusually strong and broad helium emission lines following a luminous optical flare (Mv<-20.1 mag) in the nucleus of the nearby ultra-luminous infrared galaxy F01004-2237. The particular combination of variability and post-flare emission line spectrum observed in F01004-2237 is unlike any known supernova or active galactic nucleus. Therefore, the most plausible explanation for this phenomenon is a TDE– the first detected in a galaxy with an ongoing massive starburst. The fact that this event has been detected in repeat spectroscopic observations of a sample of 15 ultra-luminous infrared galaxies over a period of just 10 years suggests that the rate of TDEs is much higher in such objects than in the general galaxy population.